The Full Moon is Friday November 7. Saturn is lost in the twilight. Mars is in the star clouds of Sagittarius and is close to the globular cluster M22 on the 6th. Jupiter is prominent in the morning sky. Comet C/212 K1 PanSTARRS is visible in binoculars before midnight. The Full Moon is Friday November 7. Evening sky on Thursday November 6 looking west as seen from Adelaide at 21:00 (9:00 pm) ACDST in South Australia. The inset shows the approximate binocular view of Mars and M22 at this time. Similar views will be seen elsewhere at the equivalent local time (click to embiggen). 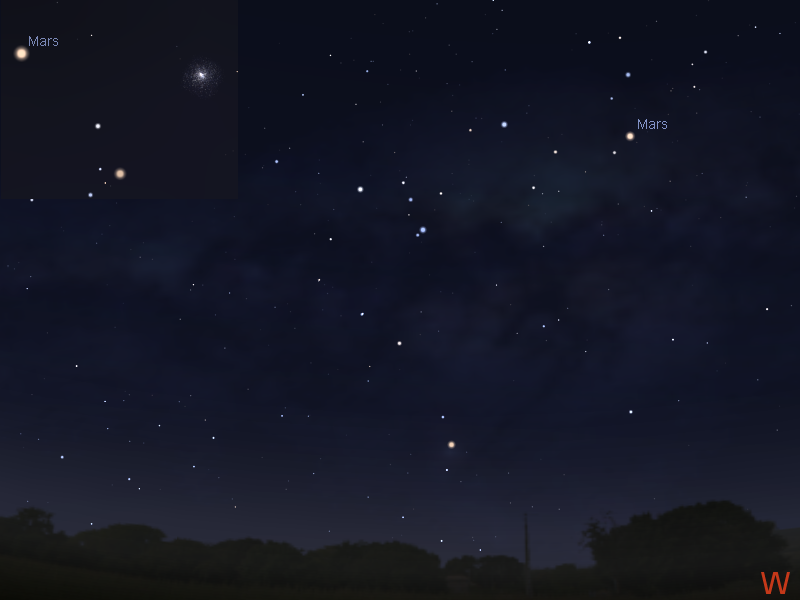 Mars is easily seen in the western evening sky, setting around midnight. Mars was at opposition, when it is biggest and brightest, on the 9th of April, and is still readily distinguishable as the bright red/orange object above the western horizon in the early evening. Mars is in the constellation of Sagittarius and is close to the globular cluster M22 on the 6th. This will look rather nice in binoculars. Morning sky on Sunday November 9 looking north-east as seen from Adelaide at 5:00 am ACDST. Jupiter is above the north-east horizon. (click to embiggen). Mercury is in the morning sky, but is too low for easy visibility. Venus is lost in the glare of the Sun. 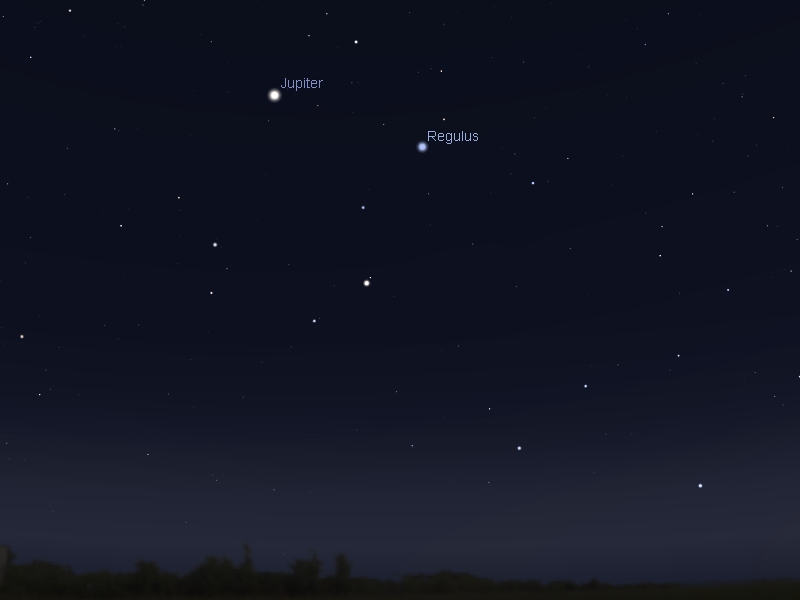 Jupiter rises higher in the morning twilight, and now is easy to see above the horizon before twilight. Jupiter is the brightest object above the north-eastern horizon. It is now not far from the bright star Regulus in the sickle of Leo (this forms the head of the constellation of the Lion). Evening sky on Saturday November 8 looking south as seen from Adelaide at 21:00 (9:00 pm) ACDST in South Australia. Comet C/2012 K1 PanSTARRS is above Canopus. Similar views will be seen elsewhere at the equivalent local time (click to embiggen). 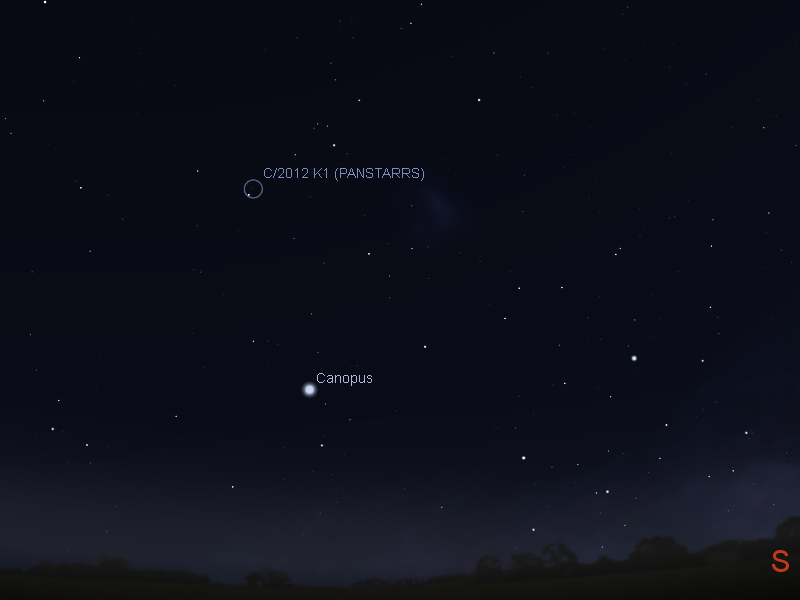 Comet C/2012 K1 PanSTARRS is now visible in the evening sky from around 9 pm. While should be easily visible in 10x50 binoculars as a fuzzy dot, until the end of the week the waxing and Full Moon will make the comet very difficult to see. 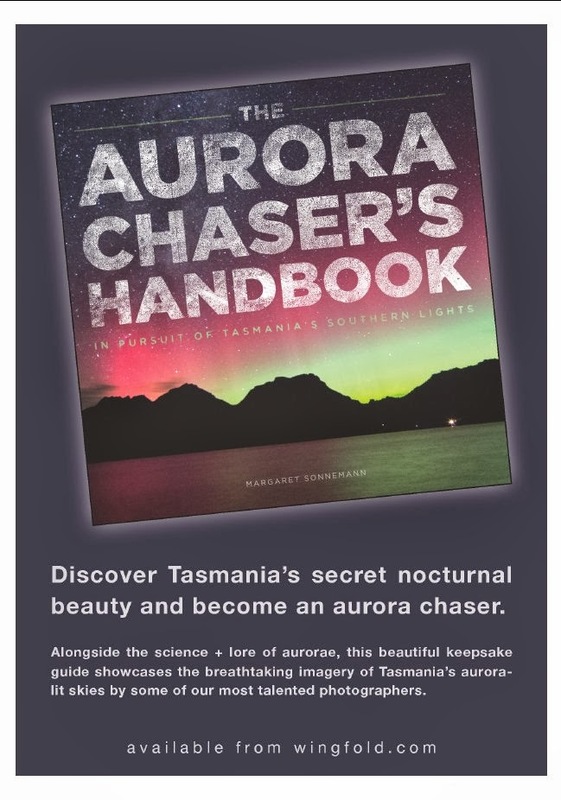 At magnitude 7 you will need to let your eyes adapt to darkness to see the comet clearly. 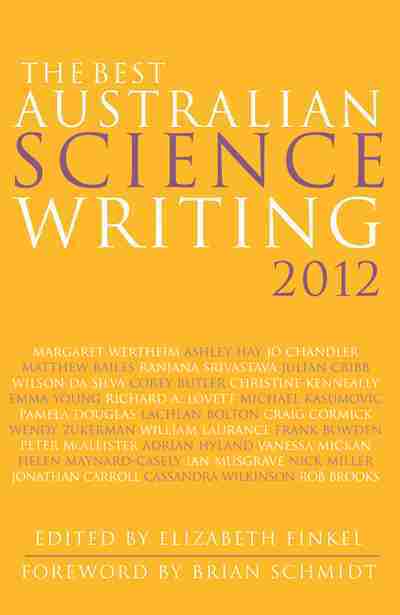 It doesn't have any spectacular encounters, but will look nice amongst the stars. On the 8th it is very close to the star alpha Doradus. Towards the end of the week the waning Moon rises later, and the early evening will be a good time to see the comet. .
More detailed charts and a printable binocular map are here.